On June 7th, the Southern California Special Olympics began the 44th annual 2013 Summer Games featuring six competitions for over 1,100 athletes with disabilities in Long Beach, California. Over 100 Stanbridge students represented REACH – Beyond the Classroom™ as they volunteered their time throughout the weekend cheering, serving food, and helping the athletes during the games. This is the second consecutive year in which Stanbridge College and its students supported and volunteered at the event. In 2012, OTA students raised over $1700 for the organization through a series of occupational therapy awareness events and fundraisers during National OT Month. Special Olympics Southern California is a nonprofit organization that empowers individuals with intellectual disabilities to become physically fit, productive, and respected members of society through sports training and competition. The Games are the largest Southern California competition of the year with athletes from San Luis Obispo to San Diego competing in aquatics, track & field, basketball, bocce, golf and gymnastics. Along with competitions, Summer Games featured free health screenings for Special Olympics Athletes, games, live music, and a Youth Summit for 60 students and educators from schools all over came to discuss leadership and how they can make an impact. To learn more about the Special Olympics Southern California, please visit www.sosc.org. 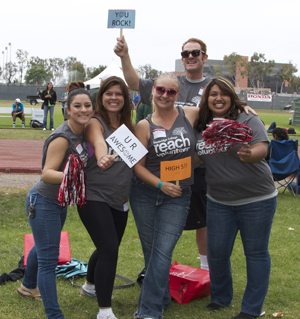 To learn more and sign up to help your local community through REACH, please visit, www.stanbridge.edu/reach.